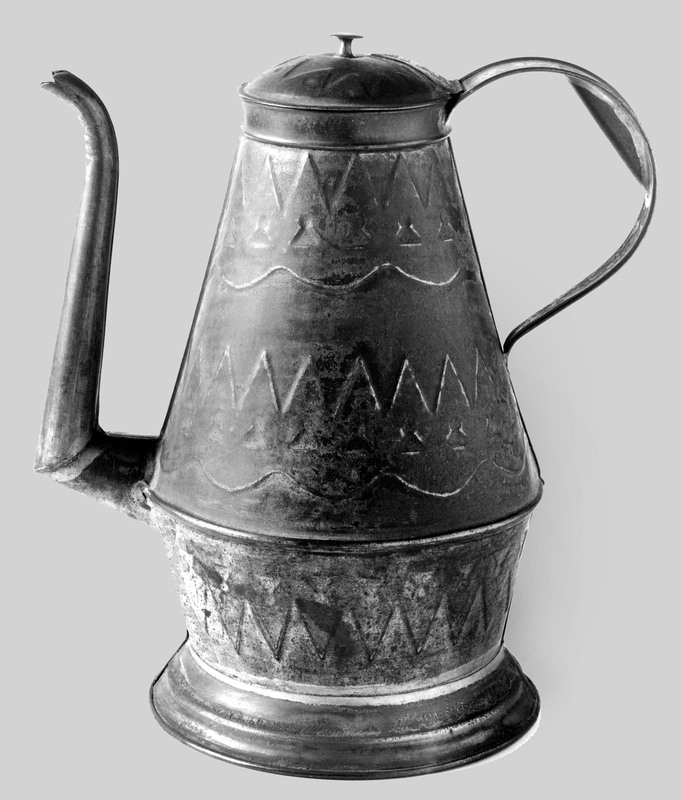 Tinware without paint or varnish was originally silvery white in color and highly reflective. Today those surfaces have oxidized to dark gray. Tinsmiths could embellish the shiny smooth surfaces prior to assembly by several methods of chasing — artistically denting the surface inward or outward — without removing any material through engraving. They could add punched designs by lightly hammering iron chasing tools with patterned or rounded tips into a sheet of tinned iron. Using another method for flat chasing called wrigglework they could create a zigzag line by pressing and rocking a sharp, flat-edged tool. Using larger tools or machinery they could stamp raised or recessed whole designs and even body parts like a lid. 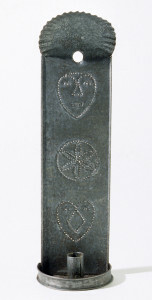 These techniques might be used separately or in combination, depending upon the tinsmith’s artistry and workshop tools. 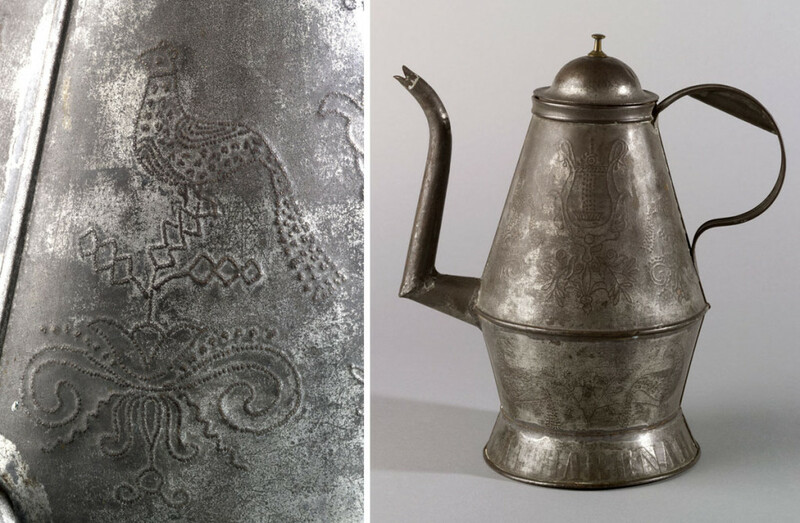 Wrigglework: The body of the conical coffeepot (left) has an eagle, American flag, large flowers, and a sinuous snake on the handle all outlined and shaded with wrigglework chasing. Punching: The second coffeepot (right) was punched with tiny, tight dots before the sections were assembled. The imagery depicts pairs of long-tail birds and elaborate flowers on the sides. It is a rare pot that includes the original owner’s name “CATHARINA H. MOYER” on the foot rim and also the tinsmith’s name stamped on the handle. 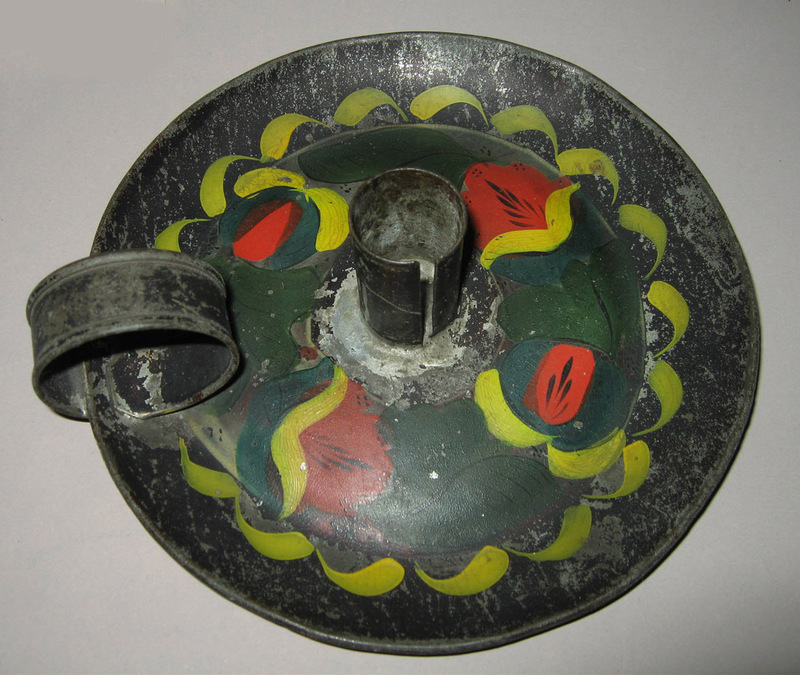 The maker, Willoughby Shade, favored this style of ornament and several of his coffeepots are known. Stamping: This third coffee pot has an unknown history, but it was probably made in Pennsylvania. Its maker ornamented the sides by stamping it with large patterns before assembly. Horizontal registers of repeated geometric shapes interspersed with zigzag designs encircle the body. Long before electricity, candles and lamps allowed human activity to extend beyond daylight hours. 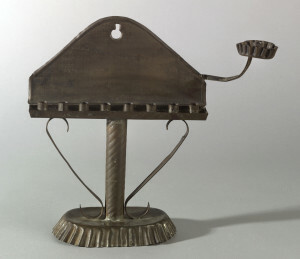 Tinware lighting devices were as effective as those made with glass or precious metal and provided an affordable option that was also suitable for exterior use. These four items once held candles, but they had visual appeal even when not illuminated. For example, the unpainted once-shiny wall sconce has pleasing shapes and faces punched and pierced into the backplate with pointed tools. Tinsmiths used hand and mechanized tools to shape and add ornament to their wares. This can be seen in the ruffled edges, called “crimped,” on the oval base of this Hanukkah lamp. To crimp an edge, the tinned sheet was hand hammered into a V-shape recess in an iron swage or compressed into a ruffle by a mechanical tool. Lantern, probably made in England, 1810-30. 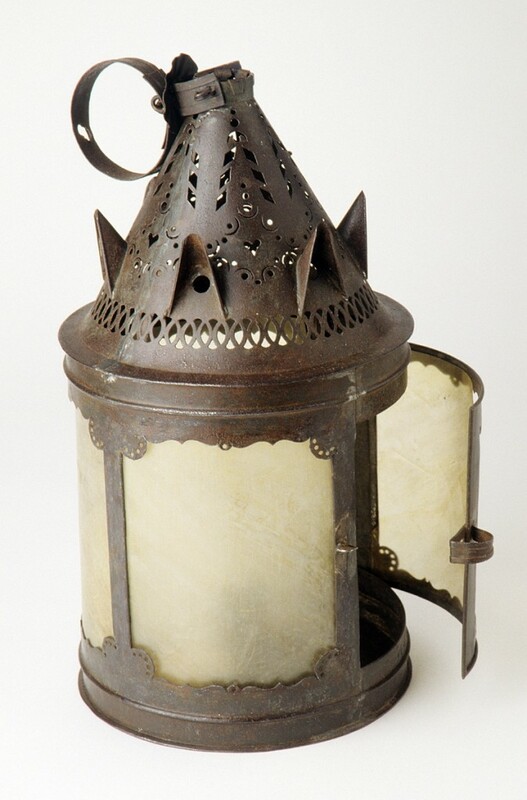 The conical top of the English lantern has pierced vent holes that were made with shaped stamps or a screw press before the piece was assembled. The shadows created by candlelight shining through the conical top at night must have been pleasing. An early word for a hand-held light like this was “lanthorn.” The name reflects the common use of flattened, transluscent, and durable cow horn for the sides. This lantern’s horn panes have been replaced by newer material. Chamberstick, probably made in the Mid-Atlantic region, 1800-50. This low candlestick, often called a chamberstick, is unusual because it has japanned designs painted inside the drip pan. The whole drip pan could have been stamped up before it was soldered to the candle cup and finger loop.